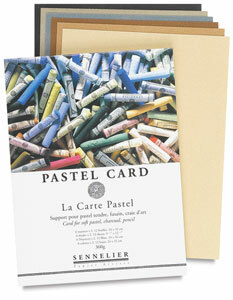 Rarely are card stock pastel supports available to the artist in a pad. 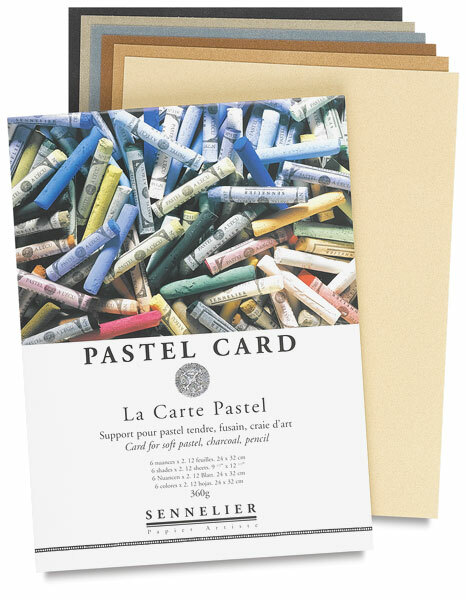 The La Carte pad offers twelve sheets of heavyweight, professional quality paper board with a finely ground coating of cork and vegetable flakes providing a uniform, toothy surface that grabs and holds even the softest pastels. The pad is top side glue bound for easy sheet removal and includes two sheets each of six assorted neutral colors. Paper is acid-free and lightfast. A beautiful surface for dry media applications. 200 lb (360 gsm). While Sennelier Soft Pastels were originally created for Edgar Degas, these beautiful100% pure pigment sticks are available for those who want brilliant color and velvety smooth lay-down.